Everyone at the Catholic Homestead is excited extremely pumped about the big Super Bowl XLIII game today, especially Catholic Son whose sheer existence seems to be dedicated to football alone. 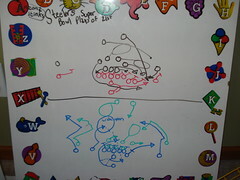 In fact, here’s a sneak peek at one of the actual game plays CS decided to share with us via Lego game table whiteboard. Check out the player details, complete with colored lines and arrows for projected movement across the field. Are you getting this? Makes a person wonder who’s leaking the Steelers’ playbook information… *shhh* Don’t tell anyone you saw it here! Hey, does that say “Arizona Stinks” up there in the left hand corner? Dude. At this time of year, the time when football becomes all the rage, the cheerleader in me rears its ugly head. How could it not after so many years of standing in the sidelines rooting my heart out and jumping around like a crazy person? I mean, the squad and I spent entire summers learning new skills and performing in competitions so that we could start the football season out right, all polished up for everyone to see. And just taking a whiff of the autumn air sends that whole excited feeling of anticipation right back at me again just like a tidal wave. Gotta love it. Why am I blogging about my old rah-rah days? Well, because I was enlightened this weekend. You could even call it an epiphany that I experienced. As Catholic Son watched football on television, a band tune caught my attention and sent me into a pep band routine that I can still perform just as if it were 1988 all over again. CS looked at me and said, “Mom! You know how to do that stuff? !” To which I responded, “Like you wouldn’t believe.” Then Catholic Girlie stopped over to watch as I repeated the moves, also in disbelief. That’s right, Mom can still do all that cheerleading stuff. So what? What exactly did cheerleading contribute to my adult life? If we’re talking about learning how to deal with competitive, jealous, backstabbing and otherwise catty-like people, then being a cheerleader provided lessons in that like no other. Or if we’re talking about having muscle flexibility and the ability to shake it up on the dance floor, then yes – it gave me that, too. But as for actual marketable skills that are useful down the road in life, not a chance. At least not for me as a technology professional, unless I decide to encorporate dance routines as a way to woo potential clients. Somehow, I don’t think that would go over very well. Coincidentally, Catholic Girlie and I found ourselves at the Symphony Orchestra the same night of my home cheerleading performance, and a certain advertisement in the back of the music program caught my attention. It said, “Playing Football, Cheerleading, Playing the Piano. Which activity will your child still be doing at age 40?” Perhaps the question should be replaced with, “Which activity will be of use to your child at 40?” Personally as a mom nearing 40, I reflect back and wish I would’ve had the opportunity to play an instrument, and then I feel a sense of pride knowing the Catholic Kids are blessed with that option today. And I truly believe that at 40 while playing Greensleeves for the family during Thanksgiving dinner, they will think back to the choice they made so early in life and know they made the right one – as opposed to performing a dance routine in the middle of the living room as a Super Bowl halftime show. Why does this all seem so much like a Jack Handey moment? Deep thinking does that to a person, I guess.